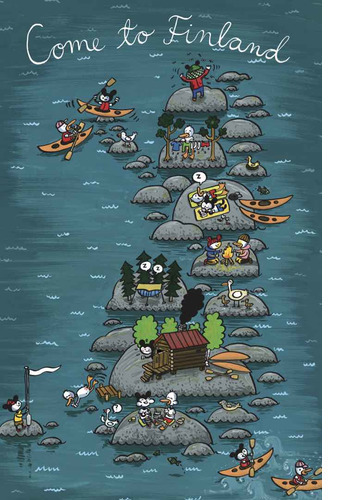 A good paddling tour is so much more than paddling: napping on warm cliffs on the beach, eating your packed lunch on beach cobbles, reading a good book while you wait for the wind to calm down, camping, swimming, sauna bathing… My poster is about the Finnish lakes, rivers, seas and islands. 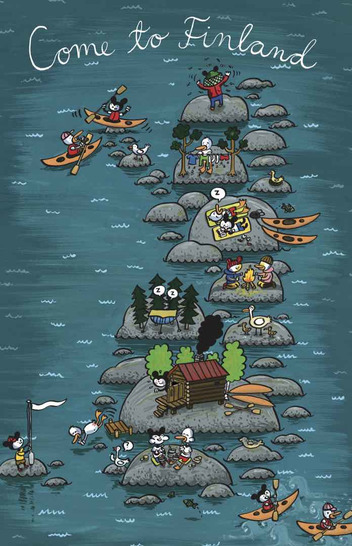 You can see my comic book characters, the mouse and the duck, alter egos for me and my husband Christoffer Leka, among a group of other water fauna. 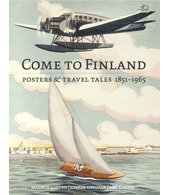 My dear friend Tuomas Mäkinen is responsible for the colour scheme. One who is yet to be talked into taking a paddling tour. I grew up by a small lake, thinking that the sea is big and dangerous, but over the last decade I’ve started exploring the Finnish archipelago by kayak and fallen in love with the open waters. Eating, sleeping and reading a good book are essential parts of a successful kayaking expedition, so I wanted to include all of these activities in my poster.